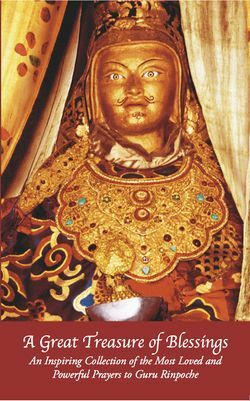 A Great Treasure of Blessings — a collection of prayers to Guru Rinpoche translated and edited by Rigpa Translations, and published by Rigpa. This book was first published by Dharmakosha for Rigpa, to celebrate the Wood-Monkey Year 2004-5 and was then revised and updated to celebrate the Fire Monkey Year 2016-7. The first edition was translated into French and German. In any vessel filled with water. ↑ All prayers are presented with line-by-line Tibetan script, Tibetan phonetics and English (or French and German) translation. This page was last edited on 27 July 2016, at 15:18.